Cutting a dog’s nails should be a regular part of their grooming routine. It’s important for their health and mobility, and it can even be a great bonding activity for you and your pup (or a simple visit to the groomers!). But how do you know when it’s time to bring out the clippers? How long should dog’s nails be and why should they be that long? Quick Answer: There’s no specific length that’s best for your dog’s nails. If you start hearing your pup’s claws tapping on the floor every time they take a step, then that’s usually the main sign that it’s time to give those nails a trim. Most dogs need nail trims every one or two months, though some may require cutting every two weeks depending on the breed. 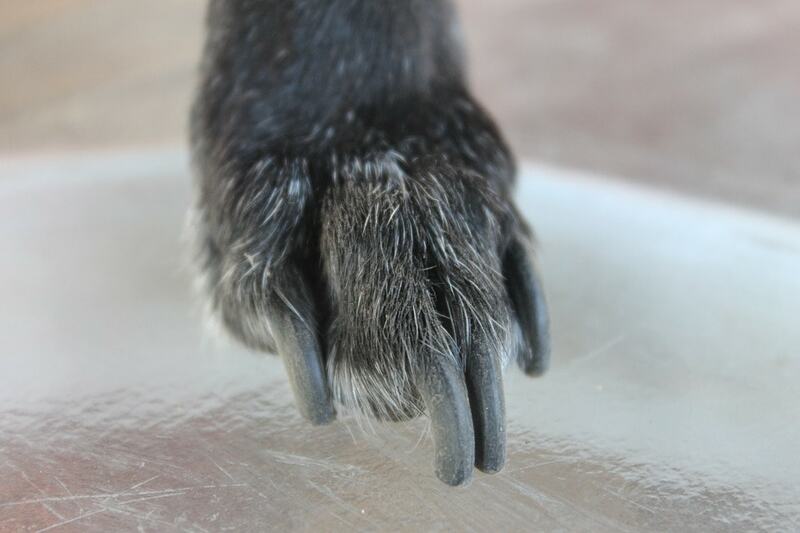 It’s also worth noting that in most dogs, the front paws’ nails grow faster than their hind ones, so you may need to cut them at different times. If your dog’s nails are very long and you’re working to get them shorter, you’ll likely have to cut a little bit off each, every 1-2 weeks. This is because long nails have a quick that protrudes in front and cutting slowly will cause the quick to shrink back until your dog’s nails can safely be cut to the length needed. You should never cut very long nails to a very short length all at once. So let’s see how long should dog’s nails be. How Quickly Do Dog’s Nails Grow? The rate at which a dog’s nails grow is determined by a number of different factors. The clearest is probably breed, as different breeds of dogs will have different growth speeds. For example, many small dog breeds need very regular trimming compared to larger ones. You should also take into account a dog’s age when planning their nail grooming. How Long Should Dog’s Nails Be? Older dogs tend to be less active, and the lack of activity can prevent their nails from wearing down, necessitating more frequent trims and clips. Conversely, a young dog who spends a lot of time running around on solid ground will wear down their nails over time, making cuts less frequently needed. The overall environment that your dog spends the most time in also affects the growth of their nails. If your pup usually runs around or exercises in grassy areas or soft, soil-filled ground, their nails won’t be worn away quite as much as a dog that is always dashing through asphalt or rougher ground. It’s easy to want to put off cutting your dog’s nails, as it doesn’t seem like a very serious or important part of grooming. However, the fact is that there are a number of unwanted consequences that could arise out of a dog’s nails being kept long and not being cut frequently enough. The more obvious negative effect is that the feet and paws of your dog could wind up in a lot of pain. When long nails hit the ground as a dog walks or runs, the nails are pushed upwards, digging into the nail bed, forcing the twisting of the affected toes or simply exerting undue pressure on the joints of the toes. This pain may start out as quite minor, but it can lead to extremely sore toes and cause your dog to dislike being touched on the paw in any way due to how painful it is. This will make it even harder for you to trim your dog’s nails in the future, and it can even cause toes to become arthritic. The lesser known but even more negative consequence of allowing a dog’s nails to grow too long is that it can permanently ruin a dog’s posture and skeletal structure, causing pain, reduced mobility, and other potential related issues. Why does this happen, and how? Most animals, especially those who walk on four legs, use the nerve endings in their feet to determine the accurate way to walk. This helps them move correctly without tipping over and allows them to effectively process gravity and physics so they can continue to walk easily. Dogs are some of these types of animals. Their ancestors back in the wild would run for hours every single day to catch prey, causing their nails to stay nice and short at all times. The only time that their nails would ever click against the ground as if they were walking upwards on an incline or hill. This means that, until today, dogs consider the press of a nail against the ground as them climbing up a hill, which causes them to shift their body’s movements and posture in order to respond to these stimuli. They lean forward slightly, using their forelimbs to support themselves as they climb the slope. The problem is that this slope doesn’t exist in dogs with too-long nails – they’re walking on flat ground, but think they’re going upwards. So, in order to prevent their forward-leaning from causing them to fall flat onto their faces, their hind limbs compensate to balance it all out. This causes a dog’s posture to shift as their paws are brought much closer beneath them, instead of neutrally standing with their legs straight out. This can cause the limbs to become cramped together and inwards, and since it’s not a natural position, it’s difficult to keep up. When left unchecked, this can lead to the overuse of the joints and muscles, primarily in the back legs. This can make simple tasks like jumping or walking up stairs and real hills difficult, and even getting up from a sitting or lying position can be tough for a dog in this position. This is why making sure your dog’s nails are well groomed is so important to their overall health. Which Dog Nail Clippers to Use? The first thing you’ll want to do when you’re about to trim a dog’s nails is getting the right kind of nail clipper. The most commonly used is the scissor-type clipper, which, as its name suggests, resembles a pair of scissors. It’s the most versatile of its kind. Go for one that has a slight concave over the sharper edge, as this will prevent the accidental crushing of a thicker nail. Use small varieties of this tool – except on giant breed dogs – to avoid cutting too much. You can also opt for pliers-style clippers, which are ideal for larger dog breeds, or for guillotine-style clippers, which are ideal for smaller dog breeds. Do note that you should never use a guillotine-style clipper for a bigger dog as it can crush the toe and become painful. It’s a good idea to opt for clippers that are made from stainless steel, as they’re safe to use, don’t rust, and often make for a sharper and cleaner trim. Do be sure to sharpen them on a regular basis, though, and replace them as needed, as a blunt or damaged clipper runs the risk of splitting a dog’s nails. Some clippers may also have a kind of guard attached that prevents those using them from over-cutting, which can be useful, but it is still possible to cut into the quick by accident even with this modification. You also have the option of using a rotary grinder. Though not as effective, they can help to shorten a dog’s nail if clipping isn’t working out too well for your dog or for you. However, despite the fact that they’re completely pain-free, the noises and vibrations from a rotary grinder may frighten a dog, so take it slow if you’re using this method. In addition, short nails that are a bit too sharp can be filed down or burred away with a Dremel, or you can use something like a pumice stone to remove the prickly tips. If you’ve never cut a dog’s nails before, it’s a good idea to ask your vet or groomer to show you how it’s done first before attempting the task on your own. While not cutting a dog’s nails at all can lead to injury and health conditions, it should also be noted that cutting a dog’s nails incorrectly can also cause nail disorders or infections. That’s why it’s so important that you know exactly what you’re doing when you’re going to give those claws a good trim. Here are the steps to cutting a dog’s nails the right way. Allow yourself to become accustomed to holding the trimmer correctly and squeezing it shut and open, so you’re not taken aback or under- or overestimating when you’re actually doing the cutting. You should also allow your dog to get used to it, too – have treats ready for doling out and be patient. If your dog squirms away, immediately stop and try again the next day. Make sure the room is well-lit so you can see what you’re doing, and gently take your pup’s paw. You shouldn’t squeeze his toes when cutting, as this can hurt and turn your dog off of clippers for a good long while. Instead, gently spread the toes apart with your fingers, and if there’s a lot of toe fur getting in the way, use some simple scissors to give the hair there a trim. Humans cut their nails from the top and downwards, but it should be done the opposite way for dogs. Start by gently slipping the opening of your clipper just over the tip of the nail. Make sure to stay within the whitish area of the nail, as the pinkish area is where the quick is. Don’t place the entire nail into the clipper – only the edge, as does the former can crush the nail. Keeping your clipper parallel to your dog’s nail, squeeze the clipper in one decisive movement. Make sure to be holding your dog’s paw nice and steadily. When you clip, the end of the nail may stay somewhat attached to the claw – don’t attempt to pull it away, as this can cause damage. That part will fall off by itself. If your dog has darker or black nails, cut more slowly and in smaller increments, or simply stop a couple of millimetres before where you think the quick maybe. Once you’ve cut as much as you can or want to, or once you can see a small pinkish colouring in the middle of the cut nail that indicates close proximity to the quick, finish up. Provide your pup with a good treat so they’re rewarded for their patience and obedience. This can make future nail cutting sessions much easier! It can be easier to cut a dog’s nails if you have a friend with you to help (gently!) hold onto them. If you’re having trouble cutting your dog’s nails at all, there’s absolutely nothing wrong with bringing them to a groomer’s or to the vet to get this done. If you cut into the quick, do not panic. Grab some styptic powder – the kind made specifically for dogs – and press it into the bleeding area to immediately stem the bleeding. If you don’t have styptic powder, you can also use corn starch or a clean soap bar. If worse comes to worst and you have none of these items, a piece of tissue will suffice. You also have the option of leaving it be and allowing it to bleed, as the bleeding will stop within 5 to 7 minutes. If your dog’s quick does not stop bleeding after this time, take them to the vet. It’s a good idea to have the blood-staunching item of your choice within arm’s reach when you’re cutting your dog’s nails. Do note that while cutting into the quick is very painful for your dog, it’s not life-threatening, so you don’t have to fret if you do so accidentally. Reward your pup with treats and praise immediately after a mishap like this and be understanding if they’re a little nervous next time you bring out the clippers! So now you know how long should dog’s nails be and why!